First, the noble bean. Your pragmatic highway coffee is made from cheaper, higher-caffeinated Robusta, while the more flavorsome, altitude-grown Arabica varieties propel the realm of special brews. Thankfully, the latter can be found throughout the day in a fine lineup of cafés—where regulars are known by their daily druthers—starting with those along Durant Street opposite the gondola. 1. Hands-on owners Victoria Haveman and John Bealty of Victoria+Co combine the subculture of Aussie brewing with barista pride. Here, a chummy blend of locals, visitors, and chisel-faced refugees from Aspen’s defunct Wienerstube restaurant (a onetime beloved morning gathering spot) populate the octane mix. 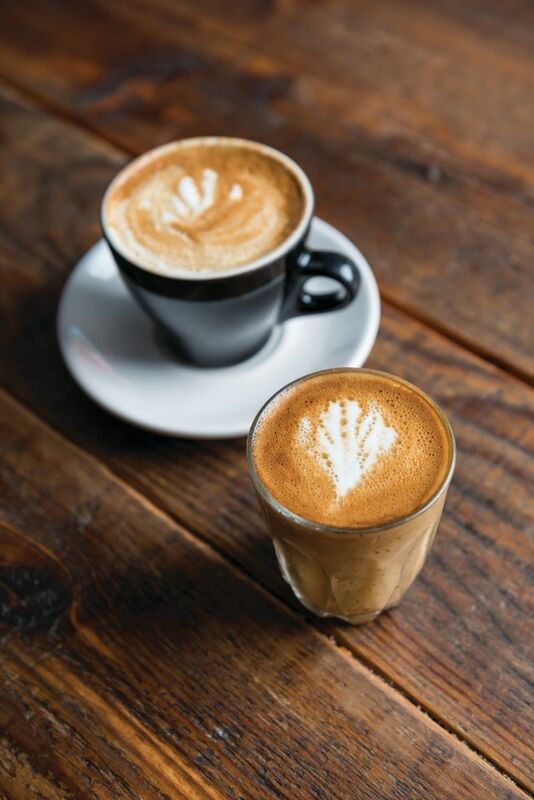 The coffee menu includes the flat white, macchiato, and its elusive cousin, the Aussie “piccolo,” each unerringly made with locally roasted double-shot espresso topped with flowered latte art. An accompanying sausage or veg roll ups the satisfaction for the morning-challenged. 510 E. Durant Ave.
2. Half a block east is Ink! Coffee. Their mantra is “coffee above all else.” The atmosphere is rapid delivery, with casual seating that dovetails into the adjacent Four Mountain Sports shop. Ink’s brain juice rotates among piquant blends and single origin; all beans are roasted at the Denver mothership. Manager Scott Kretzmann recommends the Sumatra or the black and tan blend, while also touting Ink’s traditional macchiato. A real caffeine nut might hazard the Adrenaline Junkie (a.k.a. the Hammerhead)—a shot of espresso in a cup of coffee. 520 E. Durant Ave. 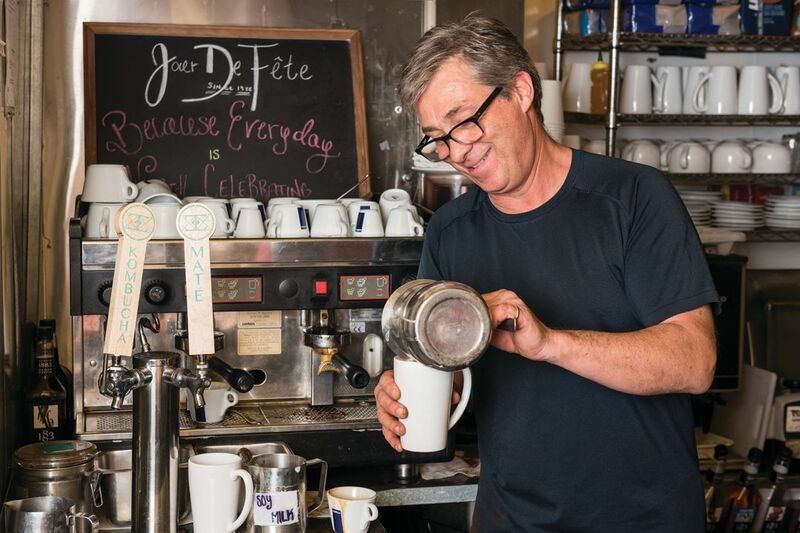 Farther east, consummate Frenchman Olivier Mottier runs the deli-bakery Jour De Fête. What’s left of Aspen’s salt of the earth line up early at the door for their morning joe. Greeting you at the counter, Mottier makes a full range of craft coffees with the quick hands of a magician, using Euro-popular Italian blend Lavazza. The Americano is a potent favorite, whether accompanied by a fat breakfast burrito or a killer chocolate éclair. 710 E. Durant Ave.
4. For an unhurried midmorning treat on the Aspen Art Museum’s expansive rooftop deck, So Café offers a mountain view, along with a who’s who of Aspen’s salon culture. Run by manager Mary Daly, who commands her realm like a benevolent quartermaster, the café offers local Rock Canyon coffee complemented by fresh croissants. Later on, espresso drinks from lattes to iced mochas accompany the artful, always-changing lunch menu. 637 E. Hyman Ave.
5. If you’re a chronic early bird with an internal homing device for unadulterated fresh brew, City Market presents solid French roast. Just wobble to the back of the store and pour your own cup for 99 cents. If you’re lucky, you’ll share a chuckle with ubiquitous store manager John Hailey, who sports a classic Tennessee drawl. 711 E. Cooper Ave.